The May barometer reading of 141 was 16 points higher than April. The rise in the barometer, a sentiment index derived from a monthly survey of 400 agricultural producers across the US, was driven both by producers’ improved view of current conditions in the production agriculture sector and, especially, their more optimistic view of the future. Driving that optimism was a large improvement in producers’ expectations regarding the future for both the US ag economy and their own farms’ financial conditions. “Over the last month there’s been a relaxation in international trade tensions with China, and that seems to be playing a role in how producers are viewing their financial future,” said James Mintert, the barometer’s principal investigator and director of Purdue University’s Center for Commercial Agriculture. The rise in the Index of Future Expectations was the largest one-month increase since January 2017. This was in contrast to last month’s reading when, in the midst of deteriorating trade relations, there was a decline in sentiment toward the agricultural economy as a whole and with respect to producers’ own farming operations. Despite the improvement in sentiment, producers’ perspectives on making large investments on their farms changed very little with only 27 percent of producers saying now is a good time to make large farm investments. Producers also weighed in on the farm bill debates taking place in Congress. When asked whether the current 2014 version of the US farm bill provided producers with a financial safety net, only 25 percent of respondents said it was effective. More specifically, when asked about the current ARC-County (Agricultural Risk Coverage) and PLC (Price Loss Coverage) income support programs included in the 2014 farm bill, only one-quarter of the respondents said these programs were effective in providing a financial safety net, and nearly one-third said they were not effective. Lastly, the May survey asked what actions, if any, a producer would take if changes to the crop insurance subsidy caused insurance premiums to increase by 50 percent. More than half of producers said they would change either the insurance product they purchase or their coverage level, and just over a quarter of respondents said they would not purchase crop insurance next year if their cost increased by half. 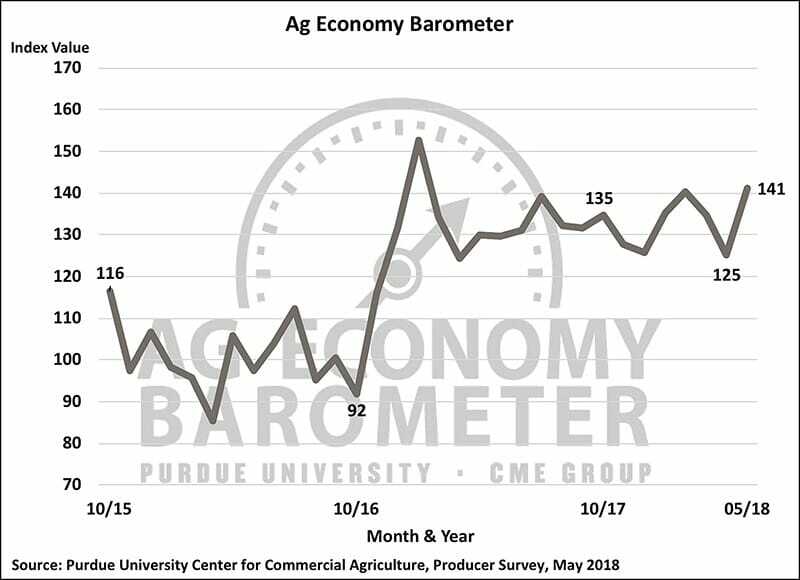 For additional information about producer sentiment regarding Farm Bill legislation, including crop insurance and subsidies, read the full May Ag Economy Barometer report at here.